sliding across you as you lay in the land of not-dreaming. fashioned in the heat of the heavens. as it finds your ear and softly whispers a daytime lullaby. sunshine, shadow, sunshine, sunbeam, shadow, flit, flicker. summer fairy lights on a lazy afternoon. their wings kissing your fingertips goodbye as they pass. you are lucky enough and this is brilliant. Serenity seeping into my pores reading this. OK I gotta ask - have you published your writing? You have a glorious, stunningly beautiful way with words and I feel truly blessed every time I stop by. bracelets of august light...i shall always remember that line. i think this may be my favorite piece of yours ever, this was perfect, every word, every phrase, every bit of light and shadow. 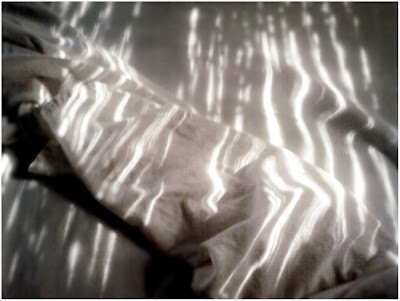 i love a good nap on my bed in the late afternoon sunlight - if i'm lucky, and get home from work on time, i lie across my bed and the sun comes in just right - melting the stress of the day away. Love this. I spent an afternoon in the hammock today. Sloane came out and snuggled with me. As we sways back and forth in the heat an orange butterfly dive bombed our heads again and again. Pamela - Bless you! I have not been published in books or a book, but have been honored to be a part of the magazines you see on my sidebar. A couple more coming this year. Thank you so much for believing! Leslye - I thought about what you said as I wrote this - it has to be that perfect time of day. If you are lucky enough, I almost said, you are there at that time. So glad to hear you are lucky enough. Thank you! Sandra - Thank you for visiting, and thank you for the kind words. I sometimes forget the magazine is still out there. It has been a while since I wrote the article. We are now in that time betwixt flowers & leaves, all green, all sun. Autumn comes late here and it will be a while before the fall leaves actually fall, although the wind has been knocking green pecans from the trees. Right now we are walking on those - LOL! Again, thank you!! Relyn - I loved that image you painted. We are suddenly in/on butterfly time; I have paid so little attention before & have no way to know if they are always here in August. I assume so - LOL! I feel quite lucky just to read your words and look at your gorgeous photos. Always a delight! There a tiny little white butterflies flitting about here these past few weeks, and I have been so amazed at them without even thinking about why. Your words say that for me. Beth - you are more than okay. :) i think if they let you catch them, you really haven't; they've just allowed it. like cats. :) besides, your birthday was near - it was a gift. yes, august brings the sweet butterflies. they spread the love, before september calls them, back home. deep sigh for the beauty here. This is simply beautiful. And you are truly gifted. Thank you for sharing your talent. Staying up way to late to blog hop tonight....Love it! Christina - of course you would know about the butterflies. I bet you have extras at your lovely home - all those gorgeous flowers calling them. xoxo thank you! Teresa - Blog hopping is one of my favorite things; there are so many fabulous places to visit! Thank you for hopping my way!! Marvelous poem. And I can't believe you got that shot with a mobile phone camera! If we are lucky enough we will find you here and dream lazy afternoon dreams with you. Yes, yes...an afternoon filled with butterflies I could not catch, scents on the breeze I could not identify, songs I could not quite remember...sometimes we must stop trying to grasp and just enjoy. That was simply stunningly beautiful. wow. Marilyn - Thank you so much. I count myself lucky to find you all here with me. I love those lazy afternoons too! LOL! Rochelle - :) Muchas gracias! I'm so glad I found your poetry, and I know exactly how you're feeling missing Maggie, I too lost my long-time companion Georgie my Ginger hobo in June. Heartfelt hugs to you. I want to read this post over and over again. And probably come back to your blog and read it again.